Dr. Mark Iwanicki- What Is The Ideal Diet? What type of diet should I adopt? 1. "Eat food"-Foods your grandparents would only have access to. Things that come from the earth, trees, bushes, animals. Foods that are "real" and not processed. These tend to live on the margins of the supermarket. Avoid packaged foods in the center aisles. 2. "Not too much"-Eating too much of any food will eventually lead to weight gain and with that comes a whole host of problems: insulin resistance, hormone imbalances, heart disease, and more. Innumerable studies point to the benefits of intermittent fasting and calorie restriction as a means of optimizing health and increasing longevity. You don't need to fast in order to receive these benefits just remember to "not eat too much"
3. 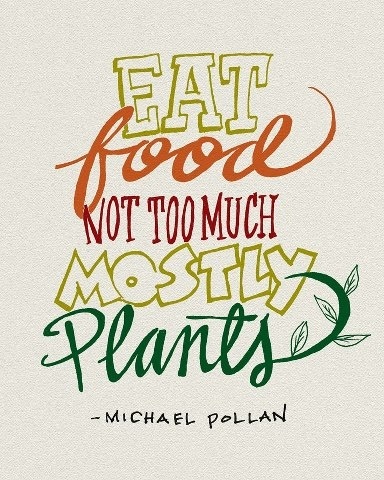 "Mostly plants"-Eating a diet high in vegetables provides us with the vitamins, minerals, fiber, antioxidants, probiotics, and micronutrients we require for optimal functioning. Whatever philosophy you adhere to, Paleo, Vegan, Omnivore, just remember to overpower your plate with mostly vegetables.